"[The technology] was designed to provide a three dimensional representation of the underground waterpipe network and at the same time provide information about the condition of both metallic and non-metallic pipes," explains Matthaios Bimpas, a researcher who was involved in the project based at the i-Sense team of the Research Institute of Communication and Computer Systems (ICCS) of the National Technical University of Athens, Greece. What is more, "[it] aimed at reducing water loss through leakage control and at promoting a water efficient, environmentally sustainable water industry by mitigating the impacts of global water cycle change that lead to the reduction of water resources," Bimpas tells youris.com. 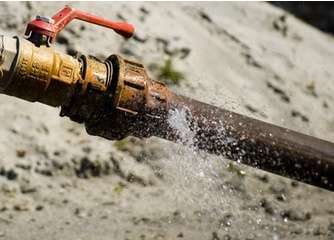 Most of water utilities industries currently use various technologies to locate leaks. The most commonly used methods for detecting water leaks can be classified in above-ground systems like acoustic equipment and external to the pipe but connected to it such as the so-called "leak noise correlator." The latter "listens" to all noise emanating from two points at a known distance apart. "The main drawback of acoustic and leak noise correlator methods is their inefficiency in detecting water-leaks at non-metallic pipes, which tend to dominate the water distribution networks," explains Bimpas. The technology developed under the project constitutes an improvement. "To overcome [the lack of detection efficiency], passive radiometric and [active ground-penetrating radar (GPR)] technologies have been developed to improve the detection capability of leaks in water supply pipes," Bimpas tells youris.com. Two specific active techniques are included using a so-called wide-band frequency modulation-continuous wave (FM-CW) radar and a so-called continuous wave (CW) radar for doppler detection. "Combining these three independent modalities is expected to provide improved detection performance for all pipe materials," says Bimpas. Within the range of alternative innovative technologies that have emerged since the project was completed, those based on transient tests have gathered great interest. "Transient test-based techniques are very cheap and do not interfere with functioning conditions since the duration of tests is very short," says Bruno Brunone, professor of hydraulics at the faculty of engineering of the University of Perugia, Italy. "The principle on which they are based is a property of pressure waves that explore the pipe pointing out the presence of a leak," he adds. When it comes to dealing with the large diameter pipes connecting the water production area and the reservoirs, such techniques allow to reliably locate and sizeable leaks. It can also identify other anomalies such as negligently partially closed valves, partial blockages due to the deposition of lime. Despite these advances in leak detection technologies, further investment needs to be made to reduce leakage. "We need to rationalise practices for leakage estimation, reporting, and target setting to ensure realistic comparisons are made between countries, and between regions within companies", says Durk Krol, director of the international nonprofit association supporting water development called the Water Supply and Sanitation Technology Platform (WssTP) located in Brussels, Belgium. He believes in the importance of understanding the factors involved in the decisions surrounding appropriate leakage reduction targets, and to ensure that targets are aligned to leakage estimates and reporting methods. "Without this fundamental work, it is likely that leakage management strategies will be inefficient and possibly ineffective." Drinking water from plastic pipes - is it harmful?